Paying members can now create up to 5 unique dashboards for each site, allowing you to have multiple birds-eye views of your analytics - all a click a way in the sidebar (as seen to the left). 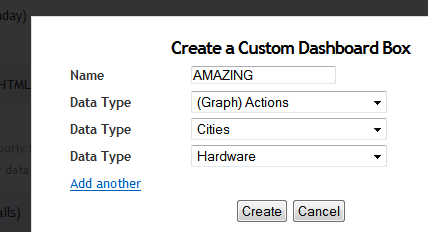 And a much requested feature is the ability to assign a default dashboard to each of your sub-users. This allows you to create things like "boss mode", where he will see only the things he cares about, but you, the analytics junkie, can see everything you want. So... how are the aggregated stats coming along? Perhaps I have missed it but would it be possible to get a hourly graph for Goals similar to visitors? Great step ahead. Thank you Clicky. I can't see it under the Dashboard category as you show? I'm a paid user. 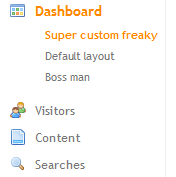 You manage your dashboards in your site preferences. Then they'll show up as a sub-menu after you've created them.